Can you believe another year on it's way out. Just wanted to wish all of my fellow bloggers a most Wonderful, Happy, Healthy New Year. I want to wish all of my fellow bloggers a Very Merry Christmas and a healthy Happy New Year. I should just say Happy Holiday to all. Because we are all so very busy with family and shopping and etc. it's a good time just to simply take a break. These are a few of the sketches from this past week. Yesterday Mike and I went searching for the Seatuk , know as the Scully Manor. 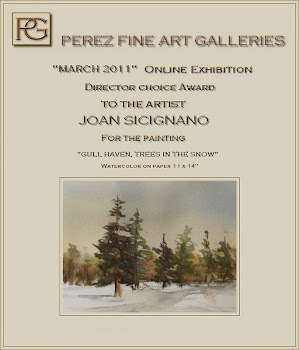 I first became aware of this beautiful place from my friend Joan who posted her lovely painting on her blog. Later I spoke with Sue, another fellow painter and she gave me directions on how to get there. Long story short, I did this on location, sun in my eyes could not do it justice and will return. As for Mr. Webster, in the 90's he commissioned me to do a portrait of his St. Charles Spaniel, Roxanne. I would go to his estate and sketch Roxanne, and then later painted her portrait. Mr. Webster was the founder of the Seatuk Environmental Society in which his property and that of the Scully Manor are all one. Happy Painting everyone. These are a few of my family treasures. Old Christmas ornaments that my mother in law used to decorate her tree. My grandchildren hung these with great care. Journaling is bringing such enjoyment and is just what is needed after my family returned to Virginia yesterday. I have been wanting to go to Sagamore Hill, the home of Teddy Roosevelt. It's located in Oyster Bay. Mike and I had a great day, we hiked down a steep wooded path to get to the beach. Not wanting to take all of my equipment, all I had was a watercolor sketch pad and my brush pens. The first sketch is with the brush pens on location. The second is a pen sketch and then watercolors. I started a 9x12 acrylic painting yesterday, still working on that one, will post next week. My little chicks are coming home for a visit tonight. Happy Painting everyone and have a great weekend. Thought it would be fun to do some mini's, to get back into acrylic painting. Happy Painting everyone. Starting with today. After getting the call I was wishing for , my daughter and the family will be visiting us on the weekend. Now I have Christmas spirit. Mike and I went to Sayville so that I could sketch some of the shops and then we proceeded to the water and a little more sketching. The tops sketch is of the Main St. Italian Bistro in Patchogue. The second is a composite of some of the places I went to with PALS, our plein air group. The coffee pot was last Sunday morning. I just want to start my day with a little fun sketch. The last is Sayville, behind main st. These are all great fun to do, without the stress of getting into anything to complicated. So hence, sketching it is for awhile. Happy painting everyone, or sketching. Enjoy. Using Anders Zorn palette of black, white, yellow ochre, and cad. red light. I first heard of Anders Zorn from Mariano Zucchi . My art work is now for sale through PayPal.